I attempt to keep the Main Street Gazette cheerful, full of optimism, with enough dissension to allow you the opportunity to take of those rose colored glasses from time to time. But today marks an anniversary of sorts for my family, and I felt it needed to be recognized here. So, this is my soapbox, and I am getting on it. 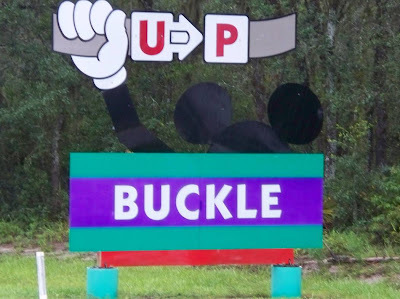 When you are driving to Walt Disney World, whether it is from your house hundreds of miles away, or from Orlando International Airport, or even just from your hotel to one of the theme parks, please make sure that each and every person in your car is wearing their seatbelt. In fact, they should be wearing them no matter where you are or where you are going. My Aunt Keeni died one year ago today in a car crash on her way to work at Walt Disney World. She had traveled this same stretch of road to work everyday for the last 20 years. On this morning, another car clipped the front end of her car and sent her off the road, end over end, while he spun out and came to a halt without a scratch on him. He then lied to the officers on the scene, concocting a fantastic story and blaming the accident on a phantom car. He had a record of illegal lane changes that caused similar accidents, and had even left the scene of a hit and run before. However, my aunt was not wearing her seatbelt and was ejected from the car as it flipped. From the severity of the crash no one has been able to say if she would have survived even if she had been wearing the belt, but it might have helped. The other driver was ticketed for the accident, but no other charges were filed. My Aunt Keeni was my family’s link to all that happened in Walt Disney World. She worked in security there, and always had a story to tell or a secret to share. I know she made many many many families’ vacation more magical because of some small thing she did for them. She would occasional get our family members into the parks, and we would always meet her at the front gates of Epcot, no matter what park we wanted to attend that day. When I was down at Walt Disney World for Epcot’s 25th, I remembered her standing there in her security uniform, and it was almost unbearable to walk through those gates with out her. 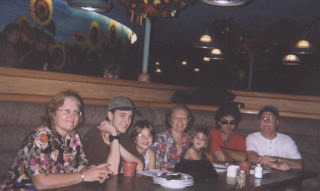 This is one of the pictures I cling to, from left to right, that is my Aunt Keeni, myself, my cousin Tam, my Aunt Suzie, my cousins Maia and Billy, and my dad. I miss her everyday. Today, on the anniversary of her untimely death, I ask two things of you. One, on your next trip tell a cast member that does something nice, something that is unexpected, for you just how much you appreciate what they do. And two, please wear your seatbelt. It shouldn’t even be a second thought, but I know there are those of you who don’t, and you should. If not for yourself, do it for your family. I’m getting off of my soapbox now. My thoughts are with you on this day. I am glad your Aunt was able to share so much of herself with others. I know that this post is almost 10 years old now but thank you. Thank you for saying what needed to be said and brining awareness to something that people don't talk about nearly enough. Saturday will be the 5 year anniversary of my little cousins death. She was involved in a car accident in Miami 5 years ago where she wasn't wearing her seat belt and she lost her life because of it. I also have fond memories of my cousin in WDW. Her family were the main ones who always took me to Disney as a child and we both spent our childhoods at the Fort Wilderness Campgrounds for Thanksgiving. It was very hard for me when we went back for our honeymoon two years ago, so many memories came flooding back to me while we were there.